While driving through Tyler, Texas, my boyfriend and I decided to stop in a pet store just for fun—or so we thought. Although we had considered getting a second dog as a companion for our two-year-old rescue mix, we had no intention of buying one from a pet store. 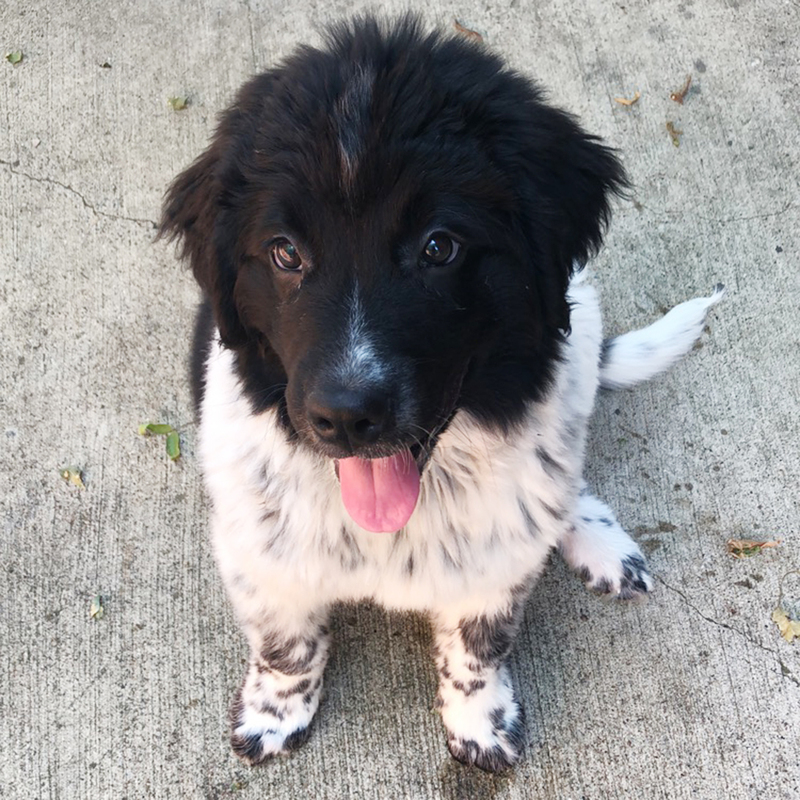 But we immediately noticed Mabel, a three-month-old Newfoundland puppy. She was one of the larger puppies at the store and shared a tiny kennel space with another large puppy. We asked if we could meet her. As soon as I petted her in the play area, I noticed she was covered in urine. The puppies at the store were forced to relieve themselves in their kennels through a cage floor, and Mabel’s long fur dragged through the waste. We were also concerned by her persistent cough, which the pet store employees said she probably caught from another puppy during her long trip from Indiana. Despite these red flags, we fell in love with Mabel’s sweet, playful personality and puppy-dog eyes. The pet store employees assured us that their puppies had American Kennel Club (AKC) registration and never came from puppy mills. I have always believed firmly in rescue and adoption, so I still had a hard time with the idea of purchasing a puppy from a pet store. However, I couldn’t stand the thought of Mabel going back into that tiny, filthy cage, so we decided to bring her home with us. Within the first 24 hours of leaving the pet store, Mabel developed a severe stomach rash that had to be treated with antibiotics. Despite being a quick learner when it came to rules and commands, Mabel had an extremely hard time with housetraining. I think crate training was difficult because she was used to relieving herself in her kennel (where she slept and ate) at the pet store. She often peed in her crate and slept in her own urine. I would wake up every two hours at night to take her outside, but she still had accidents. We also found out that Mabel had Giardia, an intestinal infection caused by parasites. Since our first dog tested negative, we assume Mabel contracted it either at the pet store or breeding facility. It took multiple rounds of expensive treatments to successfully cure her, and we also had to treat our other dog with medication as a precaution. Although Mabel is now a happy and healthy pup, I will never purchase a dog from a pet store again. I refuse to support cruel puppy mills in any way, and I’ve since learned that dogs from pet stores are more likely to have mental and physical health issues later on than those from a shelter or a responsible breeder. Puppy mill operators care more about profits than puppies. They often do nothing to uphold the health and integrity of the breed, and usually couldn’t care less if their unethical techniques lead to the suffering of dogs or heartbreak of families. Responsible breeders do not sell their puppies to pet stores. Pet store claims like AKC registration and “no puppy mill” promises also tend to be meaningless. All dogs deserve the good life—but as long as the secretive puppy-breeding industry continues to hide the truth, too many dogs will remain victims of its cruelty. Visit Barred From Love to find out how you can make a difference and stand up for puppies like Mabel.